Want to get your podcast in podcast apps? 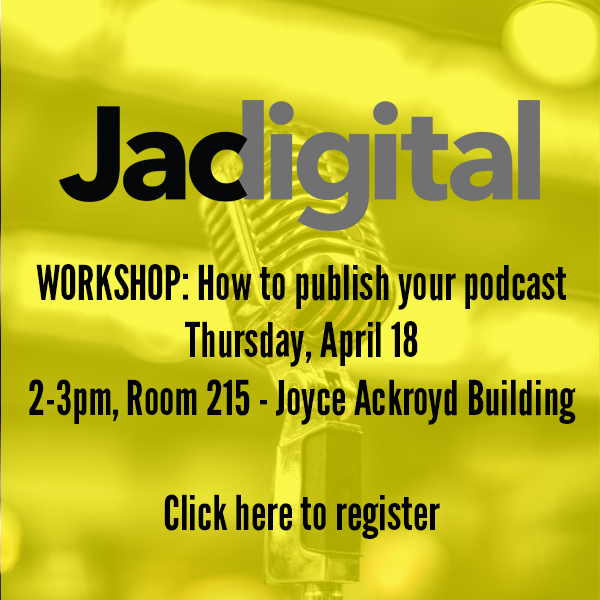 This one hour workshop will cover the technical aspects of publishing your finished podcast into different podcatcher platforms, including iTunes. Please book via Eventbrite as places are limited. Like JACdigital on Facebook to stay up-to-date with other events & activities. – How does podcasting technically work across podcatcher software and apps? – How do I test my podcast feed to make sure it is working? – What do I need in addition to my audio files to have my podcast accepted into podcatcher catalogues? – How do I troubleshoot issues with submitting my podcast? This workshop will run from 2-3pm in Room 215 (computer lab) in Joyce Ackroyd – Building 37.